Posted by Dave Emory ⋅ June 15, 2010Post a comment Email This Post Print This Post Tweet This! Introduction: Much of the program highlights a frightening article about apparent U.S. support for a Georgia-based jihadi conference. 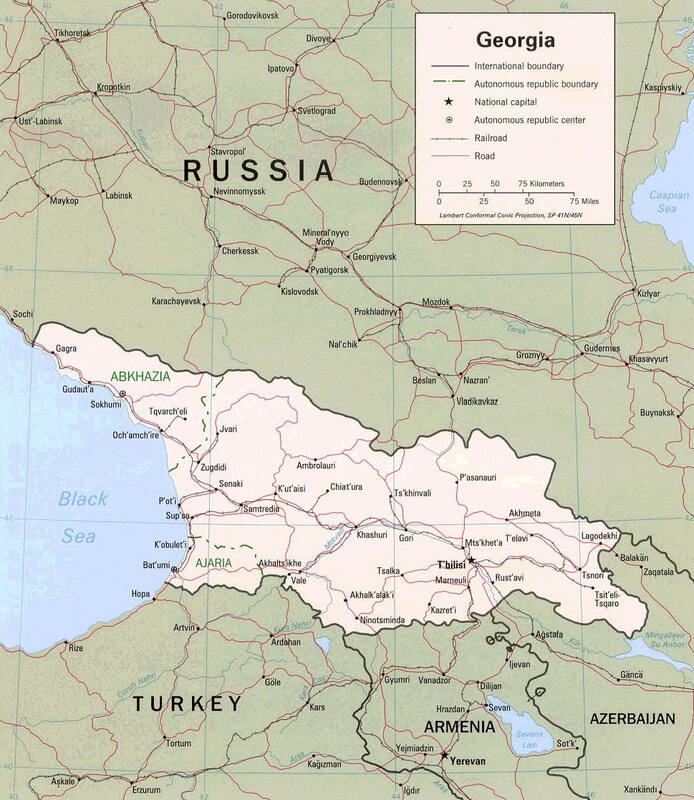 Rich with fossil fuels, the Caucasus region has long been the focal point of hostile activity by foreign interests looking to secure those resources for themselves, wresting the area away from Russia and/or the former Soviet Union. In FTR #646, we looked at the Bush administration’s close national security connections to the Georgian republic, resulting in a security agreement with that state, concluded on the eve of Obama’s inauguration. One can but wonder if petroleum constituencies in the West are looking to use Muslim Brotherhood-connected elements to foment the independence of those regions. The areas are also pivotal in the transit of heroin, in addition to logistical support for the war in Afghanistan. In the wake of the deadly Moscow subway bombings of early 2010–executed by Caucasian jihadists–burgeoning Russian fascism may well increase, fueled by reaction to these events. After setting forth a U.S. military study lending support to the “Peak Oil” hypothesis, the program notes that some private jets are exempt from FAA surveillance regulations–a situation that could work to the advantage of terrorist elements using such aircraft. Foreshadowing a scenario viewed as terrifyingly likely by counter-terror experts, the program notes that hackers apparently entered the U.S. electric grid. Terror experts have long feared a catastrophic cyber-terror attack. Program Highlights Include: Review of Daniel Hopsicker’s research concerning maverick, intelligence-connected drug-smuggling airlines; the possibility that the U. S.-supported jihadi activism in the Caucasus might result in retaliation against the U.S.; the Thyssen industrial links to the Peak Oil hypothesis; the Peak Oil milieu’s advocacy of Nazi-style genocide. 1. Much of the program highlights a frightening article about apparent U.S. support for a Georgia-based jihadi conference. Rich with fossil fuels, the Caucasus region has long been the focal point of hostile activity by foreign interests looking to secure those resources for themselves, wresting the area away from Russia and/or the former Soviet Union. In FTR #646, we looked at the Bush administration’s close national security connections to the Georgian republic, resulting in a security agreement with that state, concluded on the eve of Obama’s inauguration. In turn, it can be safely surmised that Russia will not give these areas up. In past discussions with Daniel Hopsicker, we have noted the presence of Russian organized crime figures in the Huffman Aviation milieu through which Mohammed Atta and other 9/11 hijackers infiltrated. The possibility that Russia might retaliate by utilizing some of these criminal elements is also one to be seriously considered. An analysis published Monday by Defense & Foreign Affairs offers some corroboration for the Georgia-hosted, U.S.-approved jihadi confab in December, the mention of which seemed to upset some readers. Meanwhile, Georgia is actively seeking to exploit the spread of jamaats [jihadist mini-societies] in the North Caucasus in order to go after the Russian pipelines in hope of ensnaring the US into actively supporting a new confrontation with Russia. In early December 2009, Tbilisi organized a high-level meeting of jihadists groups from the Middle East and Western Europe in order “to coordinate activities on Russia’s southern flank.” The Georgian Embassy in Kuwait, for example, arranged for travel documents for jihadists from Jordan, Saudi Arabia and the Gulf States. (There is a large and very active Chechen/Circassian community in Jordan since the 19th Century that is heavily represented in the intelligence services and the military.) In Tbilisi, Deputy Minister of Internal Affairs Lordkipanadze was the host and coordinator. The meeting was attended by several Georgian senior officials who stressed that Saakashvili himself knew and approved of the undertaking. The meeting addressed the launch of both “military operations” in southern Russia and ideological warfare. One of the first results of the meeting was the launch, soon afterwards of the Russian-language TV station First Caucasian. Initially, the US-led Western intervention in the former Yugoslavia was aimed first and foremost to salvage NATO (and with it US dominance over post-Cold War Western Europe) from irrelevance and collapse. As well, the support for the Muslims of Bosnia became the counter-balance of the US confrontation with jihadism in the Middle East. Anthony Lake, US President Bill Clinton’s National Security Adviser, formulated the logic for the US-led intervention on behalf of the Muslims. The US national interest “requires our working to contain Muslim extremism, and we have to find a way of being firm in our opposition to Muslim extremism while making it clear we’re not opposed to Islam. If we are seen as anti-Muslim, it’s harder for us to contain Muslim extremism. And if we stand by while Muslims are killed and raped in Bosnia, it makes it harder to continue our policy,” Lake argued. That in the process the US would end up partnering with, supporting and arming, the very same jihadist forces Clinton was seeking to contain meant nothing to Washington. The only thing Washington cared about was the image of a US rallying to the rescue of a Muslim cause. By 1999, the US had given up on reconciling Azerbaijan and Armenia in order to construct pipelines to Turkey, and instead Washington started focusing on building pipelines via Georgia. For such a project to be economically viable, the Russian pipelines would have to be shut down. Hence, in early October 1999, senior officials of US oil companies and US officials offered representatives of Russian “oligarchs” in Europe huge dividends from the proposed Baku-Ceyhan pipeline if the “oligarchs” convinced Moscow to withdraw from the Caucasus, permit the establishment of an Islamic state, and close down the Baku-Novorossiysk oil pipeline. Consequently, there would be no competition to the Baku-Ceyhan pipeline. The “oligarchs” were convinced that the highest levels of the Clinton White House endorsed this initiative. The meeting failed because the Russians would hear nothing of the US proposal. 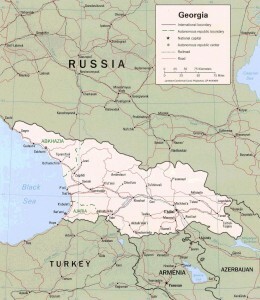 Consequently, the US determined to deprive Russia of an alternate pipeline route by supporting a spiraling violence and terrorism in Chechnya….The Clinton White House sought to actively involve the US in yet another anti-Russian jihad as if reliving the “good ol’ days” of Afghanistan, Bosnia-Herzegovina and Kosovo, seeking to support and empower the most virulent anti-Western Islamist forces in yet another strategic region. In mid-December 1999, US officials participated in a formal meeting in Azerbaijan in which specific programs for the training and equipping of mujahedin from the Caucasus, Central and South Asia, and the Arab world were discussed and agreed upon. This meeting led to Washington’s tacit encouragement of both Muslim allies (mainly the intelligence services of Turkey, Jordan, and Saudi Arabia) and US “private security companies” (of the type that did Washington’s dirty job in the Balkans while skirting and violating the international embargo the US formally supported) to assist the Chechens and their Islamist allies to surge in spring 2000. Citing security concerns vis-à-vis Armenia and Russia, Azerbaijan adamantly refused to permit training camps on its soil. Now, just to keep our — including my — heads straight, let’s remind ourselves that this exercise that Robert Spencer was good enough to let me engage in on these pages was not a defense of Russia; it was not meant to start an argument about how bad or how not-that-bad Russia is. The point is that foreign relations in a mad world require finding enough common ground with not-so-great states so that we can work together where we can work together. It’s to minimize the messiness of things. Why, when we had Russia in its historically most maleable form, did we insist on provoking and provoking and provoking? Why did we make a bad situation like Russia worse when we had an opportunity to make it better? As with all problematic countries that we nonetheless find areas of cooperation with, we narrowed even those areas by dealing with the Russians in the bad faith that had been their trademark. Simultaneously, we moved away from picking the lesser evil in a given conflict, and started siding with the greater. It’s a surreal situation indeed when the actions of my savior country put me in the position of having to “defend” Russia, whose people my parents thank their lucky stars to not have to live among anymore. I myself am a self-proclaimed Russophobe; I just had no idea how much more pathological America’s Russophobia is. So for someone who is loath to visit even Brighton Beach, I find myself in a surprising position here, pointing out where we went wrong and shoved Russia back into old behaviors. Infuriatingly predictably, one of the comment posters suggested that the line I’m taking here is one that’s paid for by Russia. The same “tip” was offered to Robert by a fellow blogger — in that tone of providing “some friendly, professional, and cautionary advice.” The likes of which I’m all too familiar with by now. (One Wall St. Journal fixture advised me, “Your views on this [the Balkans] are deeply misjudged…You’re not doing your career any favors.” Thanks. Good thing I don’t have a career, then.) It certainly would be nice if anyone paid me for anything I do, but it wasn’t to be in this lifetime. Regardless, it shouldn’t seem strange for someone to be pointing out that our foreign policy is being guided by people with a stronger anti-Russian agenda than anti-jihad agenda. And notice where this kind of thinking has gotten us. Take the past two decades of Western policy and media coverage in the Balkans, which were based on information that made its way into reporters’ notebooks directly from the Ministry of Information of the Bosnian Government run by the fundamentalist Muslim wartime president Alija Izetbegovic. The template was used again when politicians, reporters, NGOs and human rights organizations dutifully repeated what was coming out of the KLA-run newspapers and other propaganda organs of the Kosovo separatists. And so in service to consistency, having gotten into this hole, we’ve kept digging. With our Yugoslavia intervention, as the Defense & Foreign Affairs analysis points out, we’ve ended up “demonizing the Serbs and the world of Eastern Christianity as a whole.” Such that we’ve arrived at a place where the word “Byzantine” is now used to mean primitive or uncivilized. While the Muslim world and Islamic heritage represent the height of culture, tradition, heritage and civilization. “Gorin: More Details on the Georgia-Hosted Jihadi Conference Emerge” by Julia Gorin; Jihad Watch; 4/12/2010. 2. Events like the Moscow subway bombings in early 2010 will almost certainly fuel Russian reaction, which has spawned a virulent fascist milieu. Elements of that milieu have been fingered as the probable authors of the assassination of a Russian judge. With U.S.-supported jihadist elements authoring events of this type, relations with Moscow can only deteriorate. Will the reaction stemming from such events ultimately lead to a dawning of fascism in Russia, to the benefit of the Bormann capital network and delight of the Underground Reich? A leading Russian judge who received death threats after handing out long prison sentences to nationalist and neo-Nazi groups was shot dead yesterday in Moscow. Eduard Chuvashov was shot three times in the stairwell outside his second-floor apartment, just before 9am as he was leaving for work. Sources in Russian law-enforcement said that nationalist groups could have been behind the attack. Mr Chuvashov, 47, had handled several high-profile cases involving racist killings, and death threats were posted along with his photograph on extremist online forums. In February, Mr Chuvashov presided over the trial of 12 members of an ultra-nationalist group called the “White Wolves” who were accused of a series of gruesome murders of migrant workers, mostly from Central Asia. The victims had been bludgeoned to death or stabbed many times. The killings were recorded on mobile phones and posted online. Mr Chuvashov found all of the gang members guilty and sentenced them to up to 23 years in prison. Last week, he jailed another three members of a skinhead group for racist murders. Russian news agencies reported that Mr Chuvashov had been offered protection by Russian security services after receiving death threats, but he declined the offer of a bodyguard. Mr Brod said that two judges working on cases involving nationalists were attacked in Russia in 2004. One was shot dead, and another survived after a car bomb was placed under her car. The murder also recalls last January’s slaying of Stanislav Markelov, a lawyer who had worked on cases involving neo-Nazis and was shot dead in daylight on a central Moscow street. Two members of an ultra-nationalist group have been charged with the murder. . . .
“Judge Who Targeted Russia’s neo-Nazis is Found Shot Dead” by Shaun Walker; The Independent [UK]; 4/13/2010. As discussed in FTR #506, “Peak Oil” is used by the Underground Reich and the petroleum industry in order to justify: higher prices, greater profits, a more aggressive national security posture vis a vis securing petroeum, resucitation of the Fischer/Tropsch process, and reduced environmental protections. In FTR #478, we noted that Matthew Simmons–a Bush administration analyst–is one of the main advocates of the “Peak Oil” theory. In addition, we examined the use of the “Peak Oil” hypothesis to justify Nazi-style eugenics and genocide in FTR #534. “By 2012, surplus oil production capacity could entirely disappear, and as early as 2015, the shortfall in output could reach nearly 10 million barrels per day,” says the report, which has a foreword by a senior commander, General James N Mattis. The Wicks Review on UK energy policy published last summer effectively dismissed fears but Lord Hunt, the British energy minister, met concerned industrialists two weeks ago in a sign that it is rapidly changing its mind on the seriousness of the issue. The Paris-based International Energy Agency remains confident that there is no short-term risk of oil shortages but privately some senior officials have admitted there is considerable disagreement internally about this upbeat stance. Lionel Badal, a post-graduate student at Kings College, London, who has been researching peak oil theories, said the review by the American military moves the debate on. “It’s surprising to see that the US Army, unlike the US Department of Energy, publicly warns of major oil shortages in the near-term. Now it could be interesting to know on which study the information is based on,” he said. The Joint Operating Environment report paints a bleak picture of what can happen on occasions when there is serious economic upheaval. “One should not forget that the Great Depression spawned a number of totalitarian regimes that sought economic prosperity for their nations by ruthless conquest,” it points out. “U.S. Military Warns Oil Output May Dip Causing Massive Shortages by 2015” by Terry Macalister; The Guardian [UK]; 4/11/2010. 4. A frightening article reveals a major flaw in the monitoring of domestic air traffic. Many private corporate jets are exempt from FAA monitoring. This, too, could open a “window of opportunity” for terrorists to smuggle a WMD into the U.S. and utilize it on an American city. Televangelist Kenneth Copeland faced a congressional inquiry after flying his ministry’s tax-exempt jet to Maui and the Fiji Islands. South Dakota Gov. Mike Rounds has been questioned about his use of state planes for political and personal trips. And after getting a $180 billion federal bailout, the insurance giant AIG caught flak for its fleet of corporate jets. To prevent the public from seeing where they fly, all have over the years turned to a little-known program that lets private plane owners block their flights from view in the government’s system for tracking air traffic. The owners don’t have to meet any test to keep their flights secret. They merely submit a request to the National Business Aviation Association , a trade group that lobbied to set up the program on the grounds that secrecy is justified to protect business deals and the security of executives. But in at least some cases, the program has also served as a refuge for plane owners who’ve faced bad publicity, according to a review by ProPublica of 1,100 blocked planes in the program. The list was obtained after a 15-month public records battle in which the business aviation group sued  the FAA to keep it confidential. After a federal judge ruled  that the records are public, the FAA provided the list this week. It includes aircraft registered to Fortune 500 companies such as 3M and Tyson Foods, private real estate developers, government agencies and evangelical churches. There are 62 Gulfstream IVs and Vs, which cost tens of millions of dollars each, 36 Learjets and two Boeing 737s. . . .
“Off the Radar: Private Planes Hidden from Public View” by Michael Grabell and Sebastian Jones; ProPublica; 4/8/2010. 5. Counter-terror experts have long warned of the possibility of cyber-terrorism. It appears that the national power grid was hacked, although it is not immediately clear who did it or why. Speculation has focused on Russia or China, but the possibility that terrorists may have been involved is not one to be dismissed lightly. Spies have hacked into the U.S. electric grid and left behind computer programs that would let them disrupt service, exposing potentially catastrophic vulnerabilities in key pieces of national infrastructure, a former U.S. government official said. The intrusions were discovered after electric companies gave the government permission to audit their systems, according to the ex-official, who was not authorized to discuss the matter and spoke on condition of anonymity. . . .
“Spies Alleged to Have Hacked Electric Grid” by Jordan Robertson and Eileen Sullivan [AP]; The San Francisco Chronicle; 4/9/2009; p. C3. Certainly the ever-shifting strategies and logistical machinations of the US ruling classes enable collaboration with MB forces as well as Al-Queda. Pres. Morsi is all about “doing business” and suppressing with his newly minted Egyptian military alliances any indigenous uprisings by the discontented masses. Blowback from US/Al-Queda alliances made during the overthrow of Ghaddafi were on display in the killing of the US Libyan ambassador a few weeks ago. All towards advancing “US Interests” — and staving off China and Russia — in this oil soaked region.